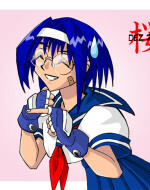 This is what Saki used to look like back in 2001, when I was drawing her all the time and she was some sort of Sakura Kasugano ripoff. So there. A tribute to something nobody probably remembers. You can see how your art has grown and evolved. And I’ll keep getting better at this rate, I’m sure. Don’t underestimate her ninja skills. Who doesn’t love schoolgirl uniforms? Good question. Sad, evil people. 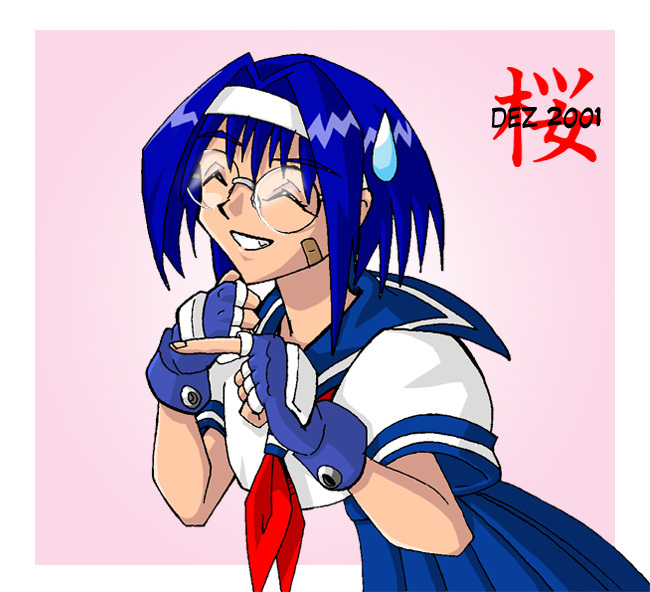 I have no interest in sailor fuku. There is some vague relation between the two, surely? This makes me feel very old… 2001?? Saki, french fries, and AOI. Back then we called them Freedom Fries… for a few weeks. I remember Sakura from Street Fighter. Nice likeness.